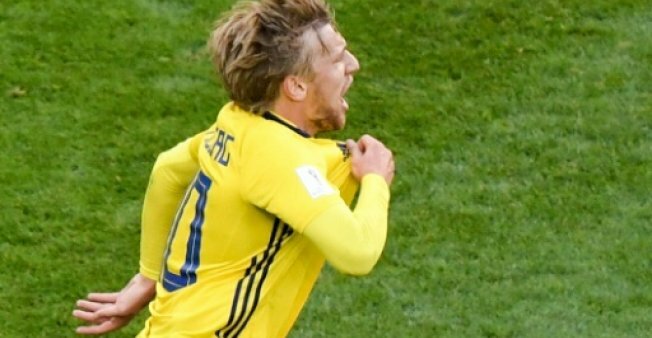 SAINT PETERSBURG: Sweden reached the World Cup quarter-finals for the first time in 24 years after Emil Forsberg’s deflected shot earned a scrappy 1-0 win over Switzerland on Tuesday. After back-to-back penalty shoot-outs, Brazil versus Mexico and Belgium’s pulsating comeback against Japan, there was always a danger this last-16 tie would struggle to deliver, even on low expectations. After a slow start, and Lustig’s foul on Josip Drmic, Switzerland grew in confidence and should have scored when Blerim Dzemaili snatched at Steven Zuber’s pull-back. At the other end, Albin Ekdal was even closer, and completely free, when he sidefooted Lustig’s cross over. Rather than let loose, both teams tightened after the interval, and Forsberg’s goal came out of the blue. With space on the edge of the box, his dummy did for Granit Xhaka before the shot was helped in by the outstretched foot of Akanji. Switzerland twice went close to grabbing an equaliser, as Djourou’s header dribbled agonisingly across the goal-line and substitute Haris Seferovic drew a late save from close range.